If you’re marketing on Instagram, chances are you’ve already run a contest or a giveaway, or you’re planning to in the coming weeks (hint: it’s time to start thinking about the holidays). 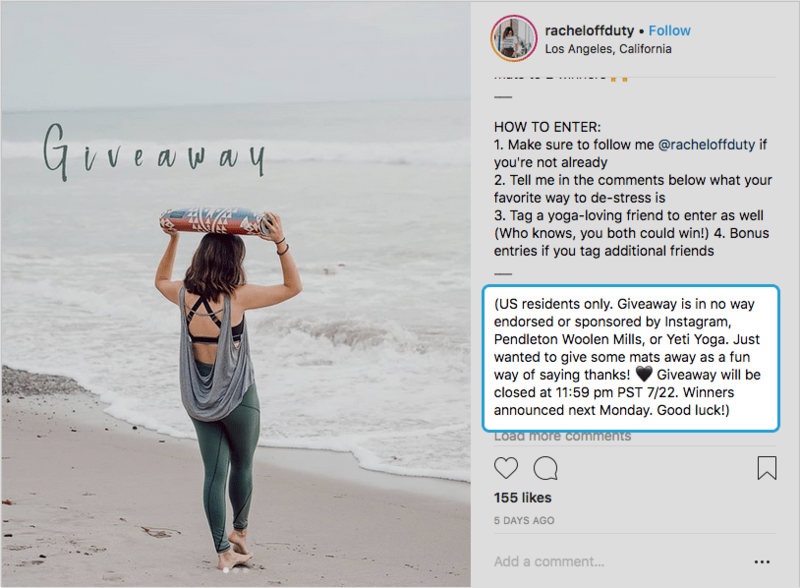 Contests are still super effective on Instagram and can generate tons of engagement — probably more than they do on any other social network — and bring you the ROI I bet you’re looking for. 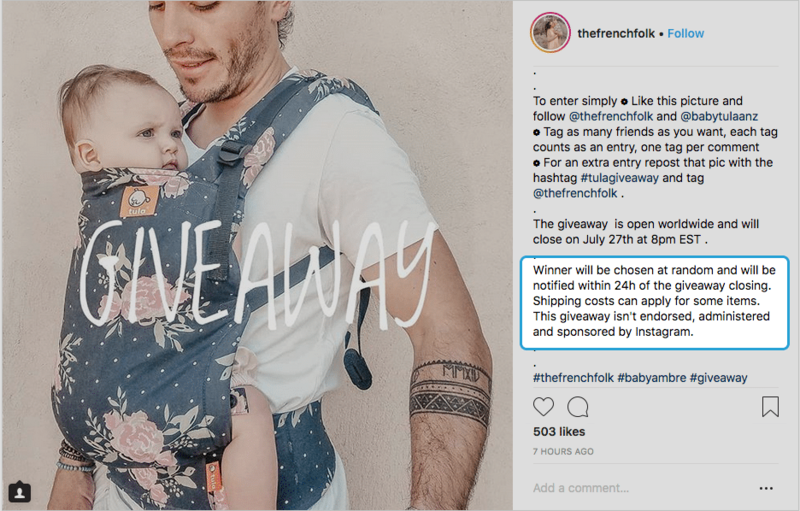 In this article, I’ll show you examples of brands large and small that are running Instagram contests right now, and take a look at whether they’re following Instagram’s rules for contests and giveaways. Why does it matter? Because following the rules will ensure that your contest runs smoothly. Ready to plan a contest or giveaway of your own? NOTE: Per Instagram, you must not inaccurately tag content or encourage users to inaccurately tag content in your contest (example: don’t encourage people to tag themselves in photos if they aren’t in the photo). Since rules may change, see Instagram’s most recent list here. 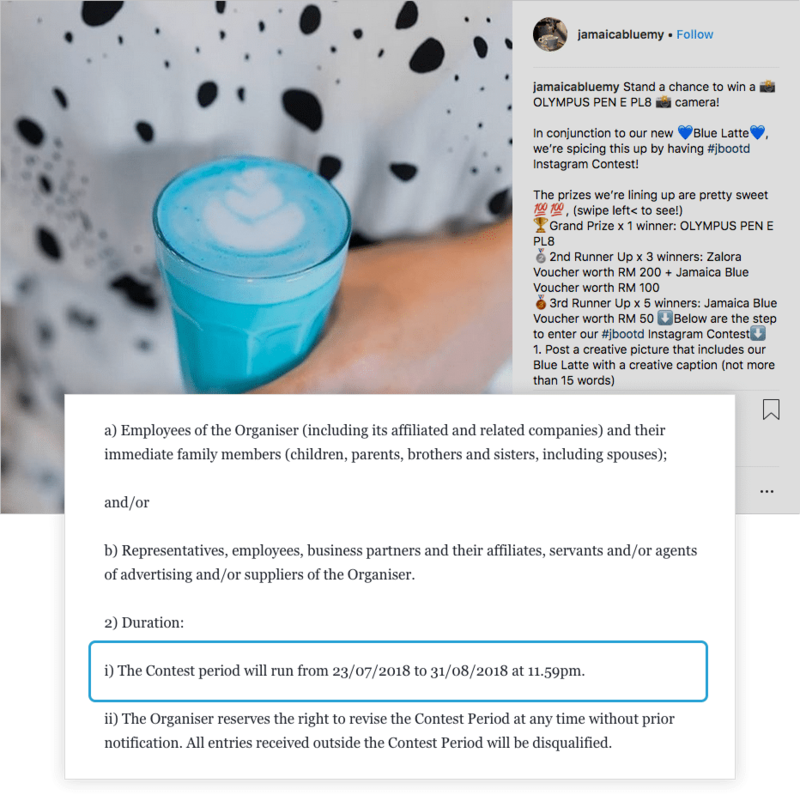 Now let’s take a look at some examples of Instagram contests and giveaways. Most of the examples are from small companies or bloggers, since these are the kinds of folks who tend to not have huge marketing teams to execute their ideas. In other words, anyone could run a contest like the ones featured below. Take a look at what they’re doing right, and what they could be doing better to follow Instagram’s rules, and what they could do better to make their contest or giveaway even more powerful. What they did right: Rachel Off Duty posted right up front that her contest wasn’t associated with Instagram. She also included clear instructions for how people could enter her giveaway. She asked people to share a genuine comment which she could eventually use to learn more about the kinds of activities her followers enjoy. What could be better: To build an email list, rather than just collect new followers, Rachel Off Duty could have offered people extra chances to win by creating a simple landing page which she linked to from her bio. She could also use ShortStack’s marketing automation features to confirm entries and send other emails to let her followers know about upcoming events or even when she published a new blog post. 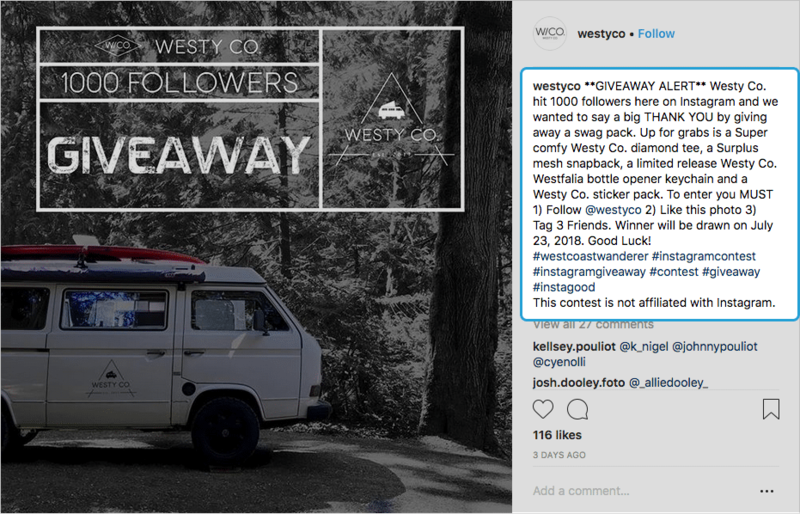 What they did right: Westy Co.’s giveaway announcement is easy to spot in the Instagram feed (and their feed is beautiful!). The photo is appropriate for Instagram and on target for this camp/surf/snow brand, but they added a bold text overlay to catch people’s attention. Like Rachel Off Duty, they state clearly that the contest isn’t affiliated with Instagram. What they could have done better: I’m not a huge fan of contests that ask participants to tag a bunch of friends….for one thing, friends might not be the right audience for the brand. (Confession: whenever I enter a “tag to enter” Instagram contest I tag my daughter — no matter what the product is. I’m allowed to annoy her :) but I don’t want to annoy my friends.) Instead, they could have asked people to share their own photos using Westy Co.’s #westcoastwanderer hashtag. 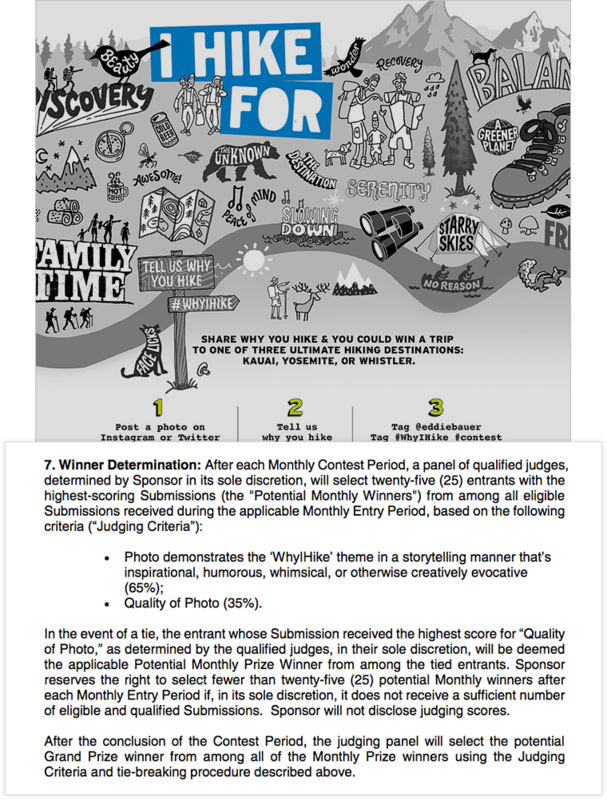 What they did right: The University of North Carolina, Wilmington, used a contest to collect user-generated content from a very specific community and they included every necessary detail about the entry period. 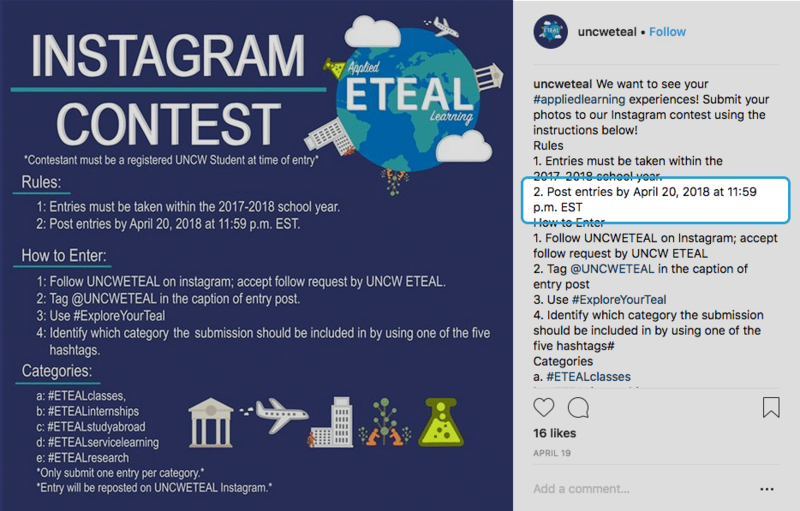 What could be better: If UNCW wanted to use the UGC they collected on the school’s website or in other collateral, they could have used software like ShortStack to pull all the entries into a gallery. The image also contains a lot of copy that would probably have been better if published on a landing page. What they did right: Suezhomefaker lets participants know about entry restrictions, including age and location, and she tells them exactly when she’ll announce the winner, right down to the time zone. 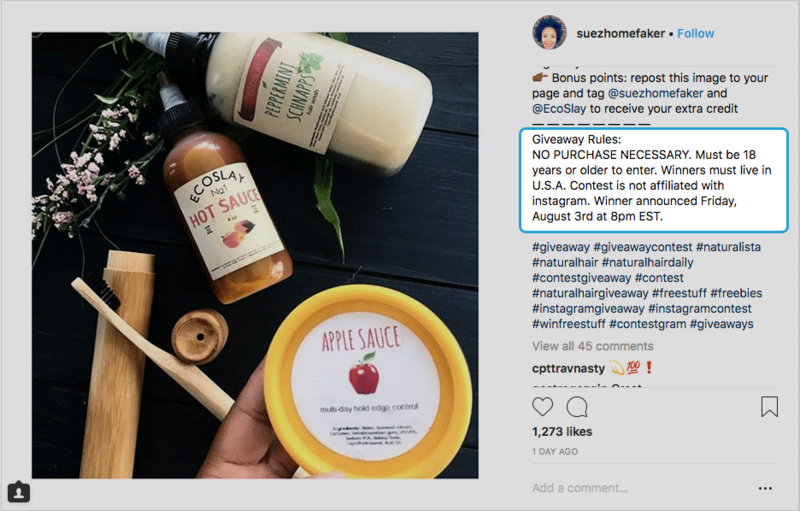 What could be better: In order to receive extra chances to win, Suezhomefaker asks people to repost her image and tag her and the brand whose products she’s giving away. There’s no easy way for her to check to see if people have actually done what she asked — it’s a manual process. To make things easier and more useful for her, she could have awarded extra points to people who linked to a landing page from her bio and filled out a short form. What they did right: Honestly, this Australian coffee brand — with a modest 4,032 Instagram followers — is doing so many things right! They added a link in their bio which directed people to a landing page with details about their new product. 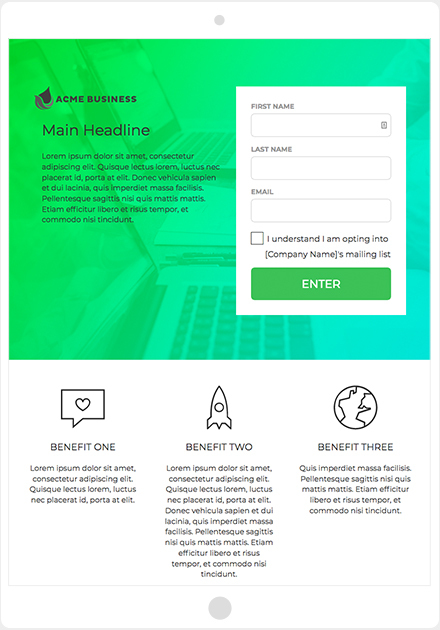 The landing page also has a popup that requests an email address for people who want to receive their newsletter and news about special events. What could be better: The only rule “violation” I see is that they should have included their time zone for the contest end date. What they did right: Eddie Bauer has done just about everything right, including adding details about how they determine the winner each month. They’ve got a very vibrant Instagram page and they’ve done a great job in promoting their hashtag: #WhyIHike has more than 60,000 posts (not all of them are also tagged with #eddiebauer, but a large percentage seem to be). What could be better: Eddie Bauer nailed it from start to finish, including covering all the rules on their landing page. Instagram Contest Rule #7: Details about how and when the winner(s) will be announced and when to claim the prize. What they did right: Shoegallery Online offers a somewhat unique take on tagging by asking people to comment with emojis (which I love!). 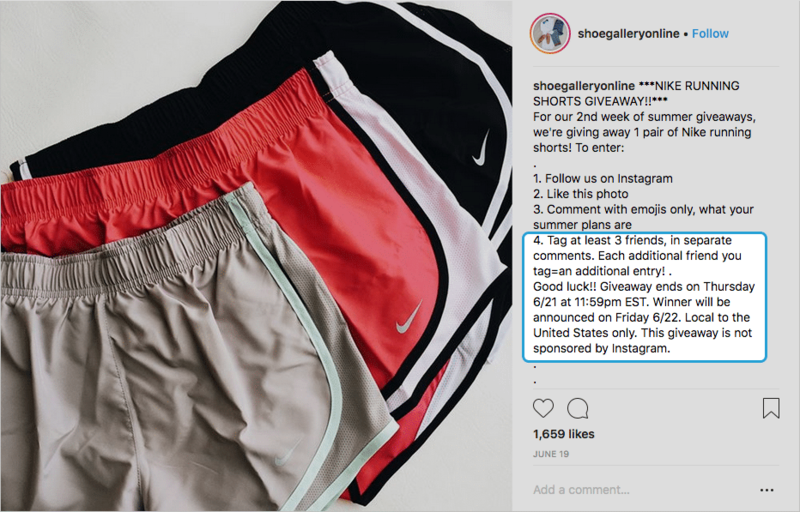 They also make it clear that the contest is only for people who live in the U.S.
What could be better: They don’t include details about how the winner will claim Shoe Gallery’s prize — presumably they do so when they contact the winner? What they did right: In the caption, The French Folk let participants know how they’ll choose a winner and when the winner will be notified. They also make sure people know they may be responsible for the cost of shipping. By clearly spelling out their terms, The French Folk avoid any complaints about the cost associated with shipping the prize. What could be better: As with so many Instagram contests, the “tag as many friends as you want” instruction could ultimately be a hassle for The French Folk, people could complain about being spammed, and this setup doesn’t give them the leads they could use at some point down the road. If you’re interested in running an Instagram contest and have questions about rules, get in touch. We’re happy to offer advice.